"isn't it that one wants a thing to be as factual as possible, and yet at the same time as deeply suggestive or deeply unlocking of areas of sensations other than simple illustrating of the object that you set out to do? isn't that what art is all about?" francis bacon (the painter), quoted in an article on august sander in the summer 1980 issue of artforum, but does not footnote the bacon quote's source. while ebay is generally a place i haunt for old music photos, records, etc. 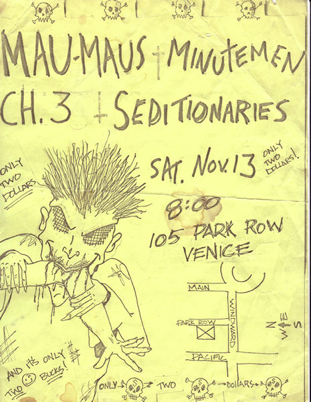 i somehow came across this punk flyer, and it floored me. as you can see, the band at the bottom is the seditionaries, a band for which i was the singer. the band formed in 1979 and broke up in 1982. i generally made the flyers for gigs, but this one i had never seen (or don't remember) and i have no idea who made it. 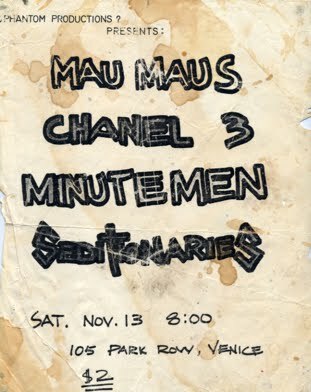 i remember playing with the mau maus (who were super great and super cantankerous - i remember playing with them at the hollywood press club, and the lead singer in a drunken stupor throwing fried chicken at the audience from the stage), and of course, i remember opening for the minutemen (twice - once on this gig, which i barely remember, and once at the cathay de grande, which i do remember - they were freaking fantastic). it would be a cliche to write about these flyers as related to proust's madeleine, but the truth is that when objects such as these appear 30 years later, soaked with the residue (both physically and internally) of the events and the pasts, these things are monumental in terms of what memories start to unfold out of them.